This transcript is brought to you thanks to the hard work of Trish Roberts. 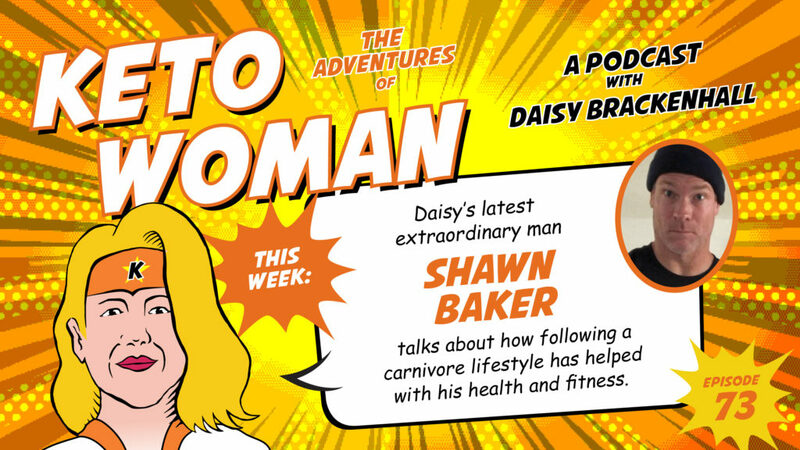 Welcome Shawn to the Keto Woman podcast. How are you doing today? I’m doing great. Thanks for having me on. It’s wonderful. I’m really excited to see it happening. I think it’s the culmination of several years of all kinds of people coming together and making this happen and Amber’s done a tremendous job. Very exciting. Absolutely. I interviewed her a couple of weeks ago and was commending her on what a great job she’s done, and she in her usual fashion said, it was just one of those things that would have happened anyway…which maybe, maybe not. Like she was saying, and you’ve just said, it’s something that needed to happen. The time is right for it. Yeah. I have no doubt Amber is making a big difference on this. I have a lot of respect for Amber. She’s done some great stuff. Yeah, me too. So tell me a bit about you. About me. So I am a 52 year old lifelong athlete. My background is in orthopedic surgery. I’ve kind of, for better or worse, been associated with the carnivore diet as I guess, sort of figurehead for the movement I suppose, if you want to use that term. I have been doing this for almost two and a half years. I’m trying to learn as much as…we’re all learning at this point where there’s a lot of stuff that’s evolving. I’ve been seeing the benefit it seems to have with people. In addition to things like ketogenic diets, which I had done for a couple of years prior to this, and my evolution in diet is common to what most people do; is they get sick and then they want to get better and they use that to get better, and that’s what happened to me. I wasn’t dramatically ill, but I just noted that despite being an athlete my whole life and training extremely hard and still even competing at the highest levels, my health was declining, and I couldn’t out-exercise or out-train what was going on, until I figured out what happens with diet. And so I went through a progression of about five or six years of doing what I thought initially was the right thing, which was, a lower calorie, low fat, high fiber diet, which in fact did work. I lost a lot of weight on that, but I just didn’t feel particularly good and I didn’t feel it was sustainable. And then I transitioned into a more Paleoesque, primal type of approach. Did that for a while. And then as I started being influenced by people like Gary Taubes and Nina Teicholz, some of the other people we all know – reading some of their stuff and trying to dig into the literature and apply it in my own life – I kind of drifted more towards the low carb and ketogenic diets. Then ultimately I just continued on the journey and ended up on this crazy carnivore path. And so that’s where I am now. And it doesn’t make much sense logically, for someone like yourself who’s expending so many calories. You’re thinking, how can there possibly be an issue if the standard model that we’re all told works – the old calories in, calories out works – how come you were having problems? Well, I’m not one that completely dismisses calories. I still think they’re useful and they do have an impact. That is to say I probably couldn’t eat…I could probably, if I force myself past satiety regularly, I would gain body fat even on a carnivorous diet. But at the same time we have to recognize that we do have appetites. We do have satiety signals. We do have differential effects of different macronutrients and more importantly, different foods in general. There’s different carbohydrates, there’s different proteins, here’s different fats. And so, corn oil is not the same as lard. Those things all impact our body in numerous ways and that goes outside of the calories, in calories out model. I think there’s people that will tell you it doesn’t matter as long as you keep the calories at a certain level and get enough protein, everything’s going to be fine. I think that tends not to hold up over the long term. Yeah. It’s just what I mean most by that, I guess is it’s just not as straightforward linear equation. That it’s much more complicated. Not at all. Like I said, I don’t think you can totally disregard calories. I think somebody said it very nicely – I can’t remember who it was – they said, it’s not that calories aren’t important, it’s just that they’re not the only thing. And I think that’s a pretty fair statement. And it really seems to depend on the context that it’s in, the kind of diet that you’re eating, as to the impact it has. Yeah. We heard Amber’s excellent talk on that today and I’ve echoed this for quite a while – I think our expectations or knowledge regarding how macronutrients and micronutrients and calories impact, this is going to depend upon a number of things, one of which is what our diet is. Our diet plays a huge role in driving nutrient requirements, probably drives calorie requirements. We certainly know that just the simple fact that protein, the thermic effect of protein, and the fact that it raises something called NEAT, or non-exercise activity – thermogenesis – and the difficulty it has to converting from amino acids into actual fat. That fact alone makes it show that it’s not all about calories. And then we can argue about do carbohydrates and fat have a differential role? I think they clearly do, although it’s probably going to be some time before that’s fully fleshed out. And so what was it that led you into making that leap from keto to carnivore? Yeah. Certainly keto had helped me in a number of “health issues”, mainly with regards to things like, quality of sleep, blood pressure, musculoskeletal health and those types of things. But as an athlete, I was looking for a competitive athletic edge. And I started reading about the fact that a lot of athletes from days gone by would heavily utilized meat-based diets for performance. And as somebody who was always looking to try to do as good as I can, I just started to experiment with that. Then I explored some of the groups of people that were doing at the time on Facebook. A lot of people gave me criticism for, but I’m like, that’s where the data was. Once you look at that, and it’s…in my view, observing a group of people online is no different than an anthropologic study. If I were to fly out to Africa and observe those people, even though I can’t speak their language, and there’s all those barriers there and I can only get a glimpse, I can do the same thing online and just ask 5,000 people what works for them. And I think it’s a valid observation. Seeing that people were having success with that I said, well, I’m going to…I had been doing it off and on over about a year – I did it for a week, three or four days here, two weeks there. And then at one point I said, well, I’m going to do it for 30 days. Just kind of do a real trial. And I didn’t die. Nothing bad happened to me. In fact, I felt really, really good. Even better than I had on a ketogenic diet. When the 30 days were over, I said, well, that was a fun experiment, I’m going to go back to the regular diet. And so I brought back in some of the foods, some of the plant foods that I’d eating – the salads and the fruits and some of the other things that I enjoyed on a ketogenic diet. And I honestly just didn’t feel as good and I thought all things being equal, I would rather feel good and that 30 days now turned into basically two and a half years, and I continue to not die. And as an athlete, I’d be interested to hear your experience of how your performance changed from the original standard American – or however closer you were to that originally, probably more healthy than that as an athlete – and then moving into the Paleo, then into keto, and now carnivore. I’d be really interested to see what kind of changes you’ve seen with that progression. Yeah, when I was eating a “standard American diet” – and I wasn’t eating a lot of junk – I was still eating what most people would consider a relatively healthy diet. I did eat some desserts here and there, and I ate a little bit of junk, but I wasn’t living on potato chips and Coca Cola. I ate a lot of real food, real healthy food, all through my life. I trained hard as an athlete up until my late thirties, mid-forties, early forties, when I started to notice, just aches and pains, it was more difficult to train, my energy wasn’t good, and I wasn’t sleeping as well. I had more…I would never have been accused of being obese, but no-one would say I was super lean. That would never be the case. Right now I’m 245 pounds. Back then I was closer to 300, but I was competing in very different sports. I was competing in sports, where at 6’5″, 300 pounds, I was still relatively small in the sports I was competing in. In those cases, having all that muscle mass was very beneficial to me. As I decided that involved me in not sleeping well, probably developing sleep apnea, having blood pressure – it was creeping up – likely having metabolic syndrome. Those things to me started to get my attention that, I don’t want to be 300 pounds anymore. That’s when I went into this dietary change and again, I tried a low fat thing for a while. I got weaker doing that, which was to be expected – losing 50 / 60 pounds – as a strength athlete, you’re going to get weaker. I can’t say I felt tremendously better, as far as the way I felt overall with regards to energy or joint health. When I went Paleo, I think it was more sustainable. I had better energy. But it wasn’t until I went keto that I started really noticing that I don’t have these aches and pains that I would normally associate with someone in their late forties or fifties, that has been an athlete their whole life. I’ve played high level professional rugby and you get beat up. A lot of concussion on your joints. A lot of collisions. I was a Highland Games athlete throwing big telephone poles and 56 pound weights. That beats up your body. I was a power lifter. I had a national record in powerlifting. All of those things take a toll on the body. By the time you get to late forties, early fifties, you really notice it. And when you hurt, it’s hard to train. But when I went on a ketogenic diet I felt that, hey, I don’t hurt as much, and my energy is pretty good, and I can train more, and I feel better, and I was leaner, and I was happier. I had enough fat, I wasn’t starving my body of fat. When I went onto a carnivorous diet, I just noticed things kicked up just another gear for me. It was possibly that the little higher amount of protein – because classically on a ketogenic diet we often restrict protein because of the fear of being kicked out of ketosis. Although quite honestly I was never…even though I ate a ketogenic-style diet and I knew I was 80% fat or something like that, I wasn’t really constantly measuring my ketones because I wasn’t really that concerned about it. But when I went on a carnivorous diet I got stronger. I noticed…and this is something I measured actually. At that point I had just set a US record on the rowing machine. It’s a very objective way to measure your power output. And I did that right before I turned 50, and I had a number – a time for a 500 meter row. And then when I turned 50, and I had just adopted this carnivorous diet, about three months later, I had not only broken that US record, but then I broke the world record. And I broke it by about 8% which is a huge increase when you’re already at a national record level. Going from 8% when you’re a beginner is no big deal. People break records by tiny amounts. Typically records are broken by less than 1% and I had broken the world record. Just to give you some perspective, the time for a 500 meter row was one minute 18.3 seconds, and I brought it down to one minute 14.6 seconds, so I took almost four seconds off the world record. It was just a huge improvement for me. My recovery got better. Certainly as an athlete, we talk about adequate recovery, we talk about overtraining, and at the end of the day results are based upon what your training is like, how intense you can train, and how frequently you can do that. If you train intensely and then you can do that repeatedly, your ultimate performance is going to get better. But that’s going to depend on your recovery capacity. What I find on this diet is recovery is excellent, and part of that has to do with the fact that when you’re training, you’re breaking down muscle tissue. And the best way to build muscle tissue back up is with protein. And the best way to get protein, the most bioavailable – and closely resembling the ratios that we need – are basically getting it through meat. A cow’s muscle is not qualitatively very much different than you and I. I’ve operated on thousands of people and we are red meat animals. And so by eating a lot of red meat, I think it helps to restore that stuff, and I’m not alone in that, and I think literally hundreds upon hundreds of people that do this no will note that their recovery for exercise is very good. So true. Every athlete I’ve interviewed has said the same thing. That it’s been absolute common thread that’s run through. They all comment on the difference they’ve seen is in the recovery. Whether they run marathons, iron man, triathletes, CrossFit trainers, all these people, the recovery they really notice a difference. Yeah, I think there’s two things. There’s probably many things but I mean certainly we know that the oxidative stress level is lower than compared to being on a high-carb diet and Volek and Phinney have done studies on that. My podcast partner, Zack Bitter, was part of one of the studies, and they took a bunch of ultra-marathon distance guys and they checked their oxidation levels after a marathon and the high-carb guys, it was through the roof and low-carb guys, it was relatively low. So they weren’t beating themselves up as much, but I’m thinking then if you combine that with the proper nutrition to also rebuild that torn down lost muscle…we turnover about 1 -2% of our muscle every day. You’ve got to get that building material from somewhere. And so if you’re eating it, it works pretty well. Yeah. And what foods do you – well obviously meat – but what do you prefer? I know you’re famous for eating a lot of rib eyes, but it seems to be a lot of people – at least when they’ve been carnivore for a while – tend to favor beef. Yeah, it is. When I started I was much more into variety. It was fish, it was eggs, bacon, a little bit of poultry, more dairy. And I think that helps with the transition process because you’re going to, let’s be honest, you’re going to a fairly restrictive menu. And if that bothers you, you’re not going to be able to do it. And so initially I was very much including as much as I possibly could and I enjoyed it. But as time went by, I found what I was craving more and more, and what actually gave me the most satiety, tended to be some sort of red meat, typically beef just because it’s so ubiquitous. Lamb is also very good source. I still do from time to time go through phases where fish seems like it’s good for a while, so I’ll eat some salmon, or I’ll cook up some shrimp, and eggs every once in a while. A little bit of dairy. I don’t tend to do much on the dairy, but that’s more or less my diet. But I would say if you were to slice my diet up over a year, I would say probably 97% of it would come from red meat. Are you a one-meal-a-day guy? Two meals? Most days it’s two meals a day, but some days I’ll drop into one meal a day. It just depends if I can get a meal in early in the morning then it’s usually two meals a day. I’ll usually do a relatively early morning breakfast and then an early dinner. I end up with something like 14, 16 hours of a fasting period. Although I don’t intentionally set a stopwatch to say I need…I know there’s a lot of benefit that people receive from having these eating windows. I think with a carnivorous-style diet, it just happens naturally anyway. I think when there’s a point where if I’m really hungry, I think there’s a reason for that. I think we have an appetite for a reason, particularly if we’re only eating one thing. What else could your body to be telling you other than, hey, dummy, you need some structure, you need some energy. So I think there’s a reason for that. It’s going to be different for certain people. There’s people that are very metabolically in a different position. They have a lot of body fat, they have other issues that are going on where fasting may make more sense for them. But for me as someone who’s relatively healthy and a relatively, normal body composition, I just eat when I’m hungry and it works pretty well. There are plenty of days that I’ll go one meal a day. Sometimes I’ll eat through four meals a day. It just depends on what’s going on. And I don’t worry about it. The nice thing about it, it’s a restrictive diet when you look at the menu. But at the same time, it’s very freeing and liberating when you don’t have to worry about things. You don’t have to calculate…for most people. There’s some people that still end up doing that or they can’t let go that. For me, I look at it – and maybe some people think this is too simplistic – but I look at any other animal out in the wild in nature and they just eat when they’re hungry and when they’re not hungry, they don’t. I’ve been to Africa and I go in the Serengeti and you look at the lions and if they’ve got blood on their face, the zebras will walk right by him. Because they know these guys are good, they’re not going to mess with them. But if they look hungry, you better watch out. And I think that’s how we are probably designed too. There’s a period of time when you’re either hungry or you’re not, and if you’re not hungry…I don’t know if you had the meal…we just had a great meal here. I’m good for probably, maybe until tomorrow. Or I don’t know, maybe I’ll eat dinner tonight and maybe just socially I might eat. But there’s the other thing, I think even if I eat beyond my appetite, like say today I’m pretty full from the beef ribs I had, and the eggs and the whatever else we had there, the porchetta…I’ll eat again tonight just to be social maybe, just for fun, and then tomorrow I’ll be like, I’m not really hungry. I probably might eat one meal a day or something like that. I think it always works out in the end, with the way this diet tends to work. And you just mentioned seeing sometimes quite a big change in your hunger levels. Have you seen a pattern with that? Like I’m thinking logically that potentially you’d have that real increased hunger after you’d been doing a lot of training, for example. That would seem a natural time that your hunger would increase? Absolutely, and part of this is…over time there’s an intuitive process that I know I need to eat. I kind of know I need to eat x amount to fuel my day. But I do notice it when I ramp up my intensity, like when I’m getting ready to compete or I’m really pushing PRs – getting ready to try to break a world record – my appetite goes up to respond to that. Whereas most days – and I’ll put this in context, I’m a big guy – four pounds of meat a day, is kind of typical for me. But when I’m really pushing hard, and I notice that I’m hitting these real high intensities, that may go up to five or six pounds and that’ll last for a week or two, and then I’m back down to kind of my maintenance mode. Certainly I think your appetite responds to the demands that are placed upon it. And I think that’s how it’s supposed to work. Yeah, absolutely. And I think what you were saying about the menu looks restrictive, but it is very freeing from a lot of the other factors that can influence how much you eat. Like I have a very addictive tendency toward certain foods and I get very snacky with things, and I certainly eat a lot of the time, not through hunger, just through boredom, or emotional eating, or whatever it is. The more you restrict that down – and that’s one of the big things I noticed with restricting down to keto – is that a lot of those cravings and things started going away. And taking it down to that extra level must almost remove those entirely. Yeah, I think there’s a lot of things in there. There’s a psychological component of eating as we’re well aware. There’s some people that don’t think there’s such thing as a sugar addiction. I totally disagree with that. I think that’s totally there. Me too. I have one. Yeah, I do too. If you were to ask me what would I want to eat, if I could eat something outside of a carnivore…and I can’t if I want to. I will if I want to. It’s not like I’m strapped to some dogma or leaving some church group, I would eat something sweet. I would eat some fruit, or a piece of chocolate or something. That’s what I would do just because that’s…I don’t really miss much in the way of vegetables. I don’t really miss bread or pastas. I just don’t really have that. But I think part of that is, if you become very restrictive for a while, and this is the one thing that some people benefit from going from keto to carnivore, because a lot of people on a ketogenic diet, they heavily use artificial sweeteners, and they make their keto desserts. And I did that too. When I was on a ketogenic diet, I would eat all the salads and do my penance to get my…I thought I was doing the right thing, but then I would always look for…I’m going to make this neat dessert. I’m going to use this coconut flour, and almond flour, and make these wonderful baked goods with the Stevia and the Swerve and all that stuff…I’d put that in there. But that was always in the back of my mind. Once I just went all meat for a period time – and it took probably, I don’t know, two months, three months – and then all of a sudden those things didn’t really even occur to me. Now the only time at this point where those things even remotely get in the back of my mind is if I’m really hungry. Like if I can’t eat for whatever reason, like if I missed a meal, or I’m in a place where I don’t have access to food, and then I’m like, I’m getting hungry, I need to eat something. Then you start looking around what’s available. Generally, fortunately, it’s not that hard – at least in the US – to find some place that’ll sell you a hamburger or a steak or something like that. Or if you’re at home, obviously we’ve got that everywhere. A lot of people get on a carnivore diet and they’re like, well, I just want to lose x amount of weight. And I say, you shouldn’t worry about that initially because you’ve got to change your relationship with food. You’ve got to beat these addictions. And the way to do that is to maintain your satiety at all times. And that may mean even gaining weight initially. Beat those addictions, change that metabolism, change that relationship with food. And then once you get to a point where you can walk by that chocolate cake and it doesn’t bother you, then you can say, okay, now I’m going to gently restrict things a little bit so I can hit my body composition goals. I see too many people that always ask me how much should I eat if I want to lose x amount of weight, and I always tell them, don’t make that your goal initially. If you’re coming to diet, you’ve got to… There’s a guy named Chris Donahue, a guy who started at 540 pounds and has lost well over 200 pounds, and he said, you don’t lose weight to get healthy. You get healthy to lose weight. I think that’s pretty wise. Yeah. Getting it the right way round. And you’re so right about sorting out the physiology, sorting out those physical cravings that can then help you with all those, emotional triggers that come up. When I’m feeling down or I’ve been triggered by something, I literally get images of cake or ice cream or whatever in my head. And before it would be almost impossible to ignore those. I’m not saying I don’t still get those, and I don’t still get the cravings, but they’re a lot easier to deal with when you’re feeling physically and emotionally stronger. Yeah. We’ve gotten so far away from the original purpose of eating. Originally it was intended to nourish us – it’s nutrition – and now it’s entertainment, it’s boredom, it’s socialization, it’s cultural overlays, and all that stuff. It’s pleasing other people sometimes. And it doesn’t help that we have an industry that drives that message 24/7. This whole thing about this snack food culture, which…when I was a kid and maybe the same thing with you, there was such thing as, your mom would say, don’t eat that, you’re going to spoil your appetite for dinner. And now it’s like, the kid’s hungry, give him a juice box, give him a granola bar. Yeah, got to carry snacks around all the time. No, it was the opposite of that. Yeah, exactly. It’s like, good you’ll eat more at dinner. And then I think the French have a nice saying – I think it’s, hunger is the best sauce, because food tastes better when you’re hungry. That is probably, as much as anything, is driving some of our metabolic disease processes that we’ve got this. Not to mention that the snacks are garbage anyway, but the fact that we are compelled. And when it starts with kids…my kids are in school. It always used to frustrate me that you’ve got to have two or three snacks a day. And I’m like, I didn’t get that when I was a kid and I didn’t die. But now we have this mentality that we literally see kids starting at three, four years old, they’ve got to have snacks. And now it’s some kind of supplement – probiotic, prebiotic, all these pills that we’re giving our kids, and we’re getting them primed to be consumers of supplements and pills. And it’s very sad to see that happening. They were just starting to come in when I was a young kid, the whole idea of snacks and how I think the Milky Way ad went against that. I think every mum would say, no, don’t have that, don’t ruin your dinner. And the whole thing was it was small and light and it wouldn’t ruin your dinner. With hindsight, looking back, seeing what was this new thing and this constant push with the advertising and in the supermarkets and all the rest of it, to where it is now, where it is just assumed that you need to snack and that kids need to be fueled every couple of hours. And to a certain extent, the kind of foods you’re often giving them, they do to a degree. Certainly you get those mood swings – the hyper activity followed by the grumpiness, and then you need to put something in them to boost them up again. I think we’re reaching a sort of a boiling point or crux where so many people are sick, and maybe things like continuous glucose monitors where people are clued into that. Also we’re seeing – and it’s not even hidden anymore, it’s almost blatantly in the open – how much backlash against things like ketogenic diets, or carnivore diets, or low-carb diets that are out there that, it’s not even like they’re trying to hide it anymore. It’s like you can see these industries are threatened by the fact that people are not wanting to…I like to call it human pet food…because that’s kind of basically what it is. So we’re not wanting to eat your human pet food anymore and take all your pills. We’re seeing this very aggressive push back, and I think it’s so obvious that people are looking at, and saying, of course. Hopefully with events like this, and podcasts. and the fact that we have social media…it’s going to hopefully change things for the good. I think if we leave it up to these big corporations…our health is not in their interest at all. And people are much more interested – with everything being out there on social media and the great resources online – with experimenting a bit more on themselves and potentially, going against that general advice that’s been given, the statutory guidelines, dietary guidelines, and all those kinds of things. They’re more willing to start experimenting. I think the low-carb/carnivore, that community, we’re experimenters aren’t we? You’re obviously very keen on self-experimentation, and you have your N=many. You must have had a lot of feedback. Yeah, in fact I’ll be talking about that in this talk here in just a bit. But yeah, coming at this from a medical background as a physician, I think physicians have kind of – not intentionally – but I think just because of the way medical practices evolve into a business where it’s throughput – how many patients can you see? Keep turning the wheels over because there’s financial reasons for that, but we don’t have the time to be curious anymore. We’ve got this paradigm, and some of these paradigms are built by pharmaceutical companies, and these guidelines are heavily influenced by that. And so we don’t take the time to sit there and we just don’t have the time to spend an hour with a patient talking to them about all these other things that may be maybe going on. Now that we’ve got physicians – because there’s a bunch of physicians in this audience today – that are waking up to this stuff, I honestly think there’s enough good people in medicine. And of course, the patients are going to want it too that this is going to evolve. It doesn’t take people too long to see that I’m tired of taking all these pills and I’m not getting better. Let me go look at Sally down the street who just said she got off all of her pills and she tried this diet. They can’t keep that a secret forever. You can see it’s almost like a little propaganda war that’s happening out there, and it’s going to continue to happen. It’s turning, isn’t it? It’s like this great ship has started, but it started that turn now and really can see that change starting to gain the kind of momentum that you can’t stop. Yeah, and I agree. I don’t know if you know Gary Fettke from Australia? He’s an orthopedic surgeon like myself that got in trouble for telling patients not to eat sugar. Ridiculous, as we all think, but we talked about it – and I can’t remember the exact term he used, but it was basically talking about a school of fish and what it takes to turn a school of fish. It’s about 3%. So if you get 3% of those guys turning, then you can actually make a difference. And I think we’re…I would say, how many people in the world are on a low-carb or a ketogenic diet? I say we’re probably close to that or maybe we’re there. But I think we’re going to see a definite continued turn in that direction. I don’t think it’s going to stop despite the best efforts. Me neither. I feel really hopeful. Yeah. It’s fun. It’s exciting. It’s going to change a lot. It is. Yes, it’s exciting to be part of it. It is. I’ll tell you it’s exciting to be part of this very first carnivore conference. Great to be able to say, I was there. And that’s the thing, I’m fully supportive of any kind of diet, quite honestly. I think people have the right to do that. But I think the one unique thing about a carnivore diet is it’s so much against everything else you’ve been taught. The fact that everybody’s not dropping dead of scurvy, and dying, and getting sick but rather, they’re getting healthier – is so in your face, that it’s causing a lot of thought to change. And I think that’s a fun thing to see. So where can people find out a bit more about you and the experiments you do online? On social media, it’s @shawnbaker1967 on Instagram. I’ve got 66,000 people on that. And Twitter, @SBakerMD – I think we’ve got about 35,000 / 37,000 something like that. I’ve got a YouTube channel, just Shawn Baker. I’ve got meatheals.com is a great website- we’re just collecting all these different stories. One of the problems I’ve got when I go to these Facebook groups, I can never find the things again. It was very difficult to manage it. So I wanted to collect all these different anecdotal stories and we’ve started to catalog those by arthritis, obesity, mental health issues. So anybody can go in there and say, I’ve got psoriasis. Well let me look, how many people got their psoriasis improved by this type of diet. So mealsheals.com. We’ve got the World Carnivore Tribe on Facebook. It’s the largest carnivore tribe currently. There’s almost 27,000 members on that one. We just started a year ago, so we’re growing pretty rapidly. Let’s see, there’s shawn-baker.com. I’ve got a little bit of writing in there and some interesting links for people that might want to do that. And then of course, I’ve got a book coming out – “The Carnivore Diet” – should be out later this year. That’s available for pre-order now on Amazon and whatnot. Well, your timing couldn’t be better. It’s the absolute buzz word and buzz thing – that new diet that people are trying. Its popularity surge has been incredible over the few years. Yeah. Hopefully it will reach a wider audience and if it sells a lot of books, I’ll be a happy guy. I’m sure you will and I’m sure you will. Well, thank you very much. Have you got a top tip to round us off with? I think probably the most common tip I tell people at the beginning is if you’re going to transition into a carnivore diet, if you’re going to just jump straight into it – and some people may need to transition, they may need to slowly taper off through things like a ketogenic diet, taper out fiber, taper off things like oxalates are potentially…that’s another topic. But once you get there, don’t feel like you have to restrict, don’t cut your calories. Don’t worry about micromanaging every little detail. Enjoy it. Enjoy the food. Learn how to cook and be decadent about it. Cooking’s a big part of it, isn’t it? Yeah. Learn how to make a nice steak. Enjoy these. There’s lots of animal cuts out there. There are thousands of different ways you can enjoy different types of meat. And don’t be shy about using eggs, and even dairy in the beginning. Just get into it and then you can start to sort of shift and change. And it seems to be a natural progression. Like you say, you started out with a much larger variety, but you just ended up falling into predominantly beef just because that’s what satiated you. That’s what your hunger signals were telling you wanted. Right, and I sometimes like variety still. I still have it. If it’s there, I’ll still eat. I still enjoy it. It’s just when I’m just cooking for myself, which I often do….it’s like when I feed my dogs, they’re happy. They’re there. They’re jumping around excited. They just get a bunch of meat. They’re happy every day. So they’re carnivore too, are they? Yeah, they’re carnivore too. They’re happy dogs. Yeah, mine are. Not completely, but mostly they found a balance. They actually do better with a bit of kibble as well for some reason. But yeah, they get their meat and they love it. Fantastic. Well, thank you so much for taking the time out to talk to me. It’s been a pleasure. My pleasure too. Thank you. Gonna pretend you never posted this - slated to listen tomorrow morning!